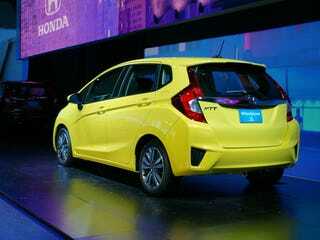 The all new 2015 Honda Fit was supposed to hit dealerships on April 14, but Honda is holding back deliveries. Initial reviews of the refreshed car has been overwhelmingly positive and it looks to be an evolutionary improvement over the last generation. Consumer Reports has investigated why we are not seeing the 15 Fit on the lots. "The Fit is being built for the first time in North America, a significant new investment in Honda's 8th auto plant in the region and one that features some of Honda's latest and most advanced manufacturing technologies. As this is an all-new plant, we are taking a measured approach to the production ramp up and shipments from the plant have been slower than anticipated. As we build up substantial inventory to sustain the nationwide sales launch, deliveries of the 2015 Fit to Honda dealerships will begin the second week of June." CR suspects that Honda has discovered something in the new Fit that needs to be fixed before it goes on sale. Given the massive GM recalls, and the fact that Honda tends to take a more conservative approach to launching new models, the brand is taking a very cautious approach to quality control. It seems to me that Honda would rather have customers wait for delivery than have them return to the dealerships for a possible recall. I understand Honda's position on this, but what I find strange is why the '15 Fit configurator is still not live on Honda's website. Often automakers will let you configure colors and options before a car actually goes on sale.